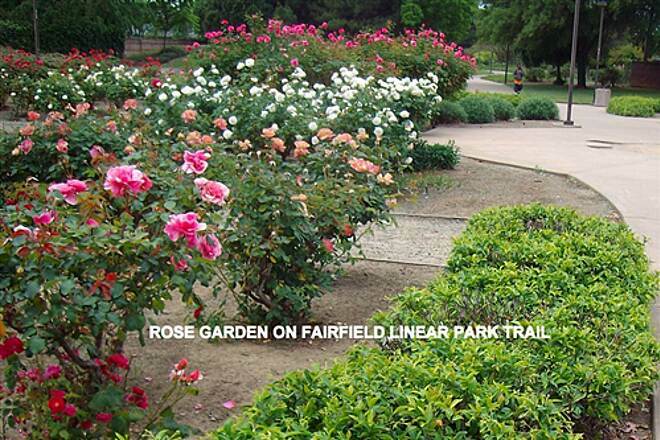 Running from Solano Community College on the southwest edge of town and into the town of Fairfield, the Fairfield Linear Park Path provides convenient bike access to the action on campus and in the city center. 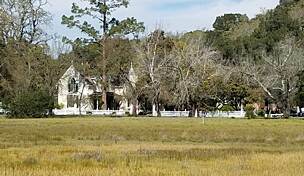 Once leaving the college, the first 3 miles of the path follow closely beside Interstate 80 through open farmland, passing some light industrial areas along the way. In this section, the path is fenced on both sides, so there is limited access. 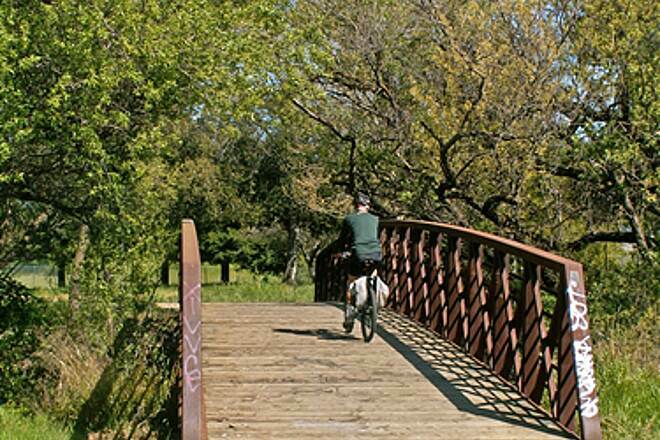 Mature trees provide considerable shade, and bicycle bridges provide passage across several small streams. 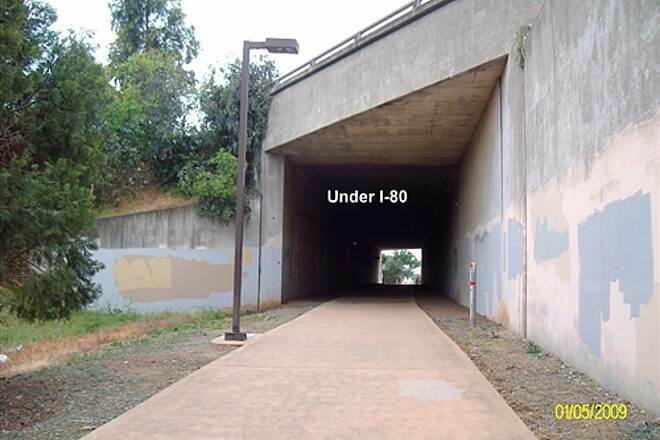 At about the 3-mile mark the trail crosses under I-80 and abruptly changes character. The surface changes from asphalt to concrete, streetlights appear and the trail winds through quiet residential subdivisions. There is easy trail access at multiple points on this section, as well as plenty of benches and picnic tables, and two tot playgrounds. 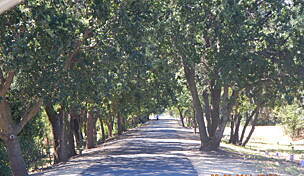 The area is extensively landscaped and well maintained, providing a pleasant park-like atmosphere. 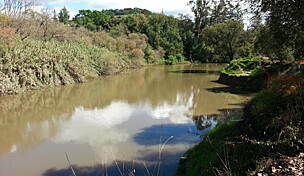 Nearby residents make full use of this part of the trail for dog walking, biking, evening strolls and family gatherings. For now the trail ends at Dover Avenue. If you're in Fairfield in mid-August, check out Fairfield's popular Tomato Festival and West Coast Barbeque Championship. 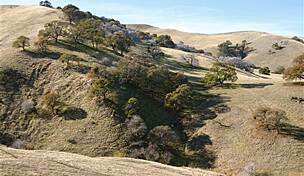 You're also very close to several wineries in Suisun Valley. 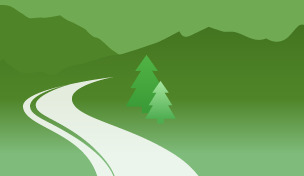 To reach the Solano Community College trailhead, exit Interstate 80 at Abernathy Road and go north for 0.5 mile. You will cross over the bike path, which is adjacent to I-80. At 1.7 miles turn left on Rockville Road. 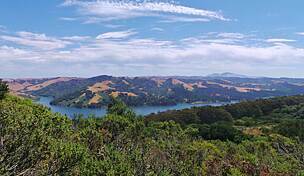 Proceed to Suisun Valley Road and turn left. 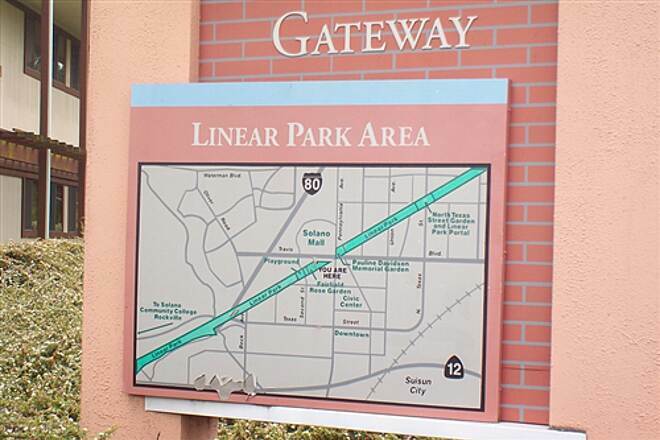 Go 0.3 mile to Solano Community College. 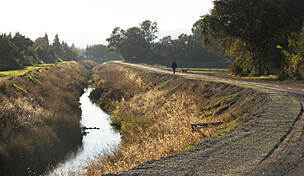 The bike path starts at the rear of the large campus behind the soccer fields and adjacent to a small bridge leading over a culvert to the school baseball field. 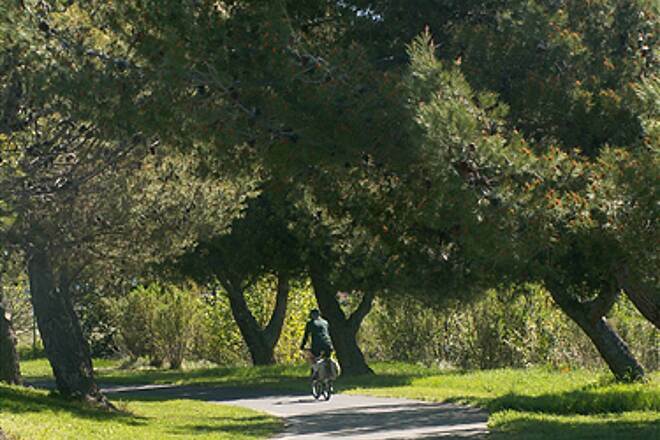 To reach the Solano Mall trailhead, exit I-80 at Travis Boulevard. 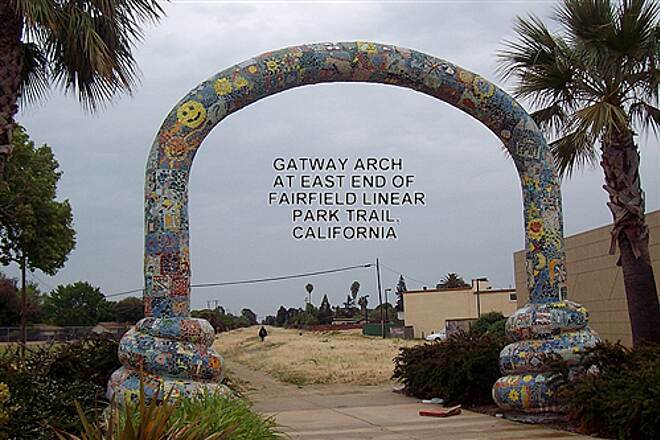 Go east 0.5 mile to Solano Mall. There is ample parking at Solano Mall. 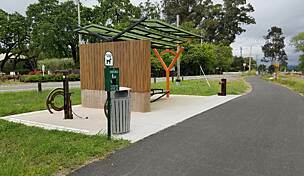 The trail starts at the PARCOURSE sign in the grassy park area on the other side of Travis Boulevard, near the intersection of Solano Mall Road and Travis Boulevard. Solano Mall Road is one of the main entrances to the mall; a traffic light aids in crossing busy Travis Boulevard. There is parking on Dana Avenue east of the intersection with Pennsylvania Avenue. 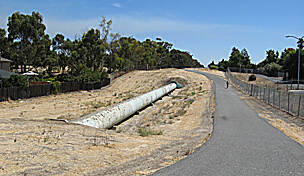 We rode this trail from beginning to end for the first time on a Sunday morning beginning at the Solano Community College. It was not easy to find the beginning but it is between the ball field and the football field. There was a lot of natural debris (i.e. pine cones) at the beginning. The segment to the mall is quite pleasant and well maintained but there is the occasional homeless camper along the route. However, it is shady and cool. Once you get to the mall, there are no signs to tell you to turn right, then left at Pennsylvania and then an immediate right. After that, the trail gets pretty ugly. 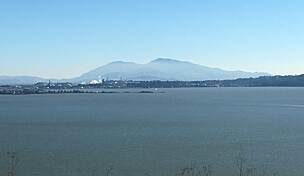 Bright sun - no trees and litter, garbage and weeds for the next couple of miles. There were lots of indigent looking folks camped out along the trail and we saw no signs of anyone else enjoying the trail such as families, joggers, dog walkers, etc. that you would expect. Apparently, this portion of the trail is not patrolled or maintained. Whose trail is it anyway! March, 2015 and the gate remains closed and chained near the college. However, it is broken down and there is a bypass around the absurdly short fence line (about 40'). The fact that the Fairfield City web site continues the list this pathway as "a safe pedestrian and bicycle path for residents to travel" despite the lack of maintenance and the closed gate at one end is an excellent example of bureaucratic duplicity. 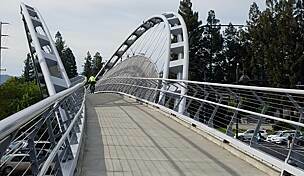 Fairfield wants the credit for the many hundreds of thousands of dollars spent to construct the trail while at best providing a inconvenient, and possibly hazardous, travel experience for residents and visitors. 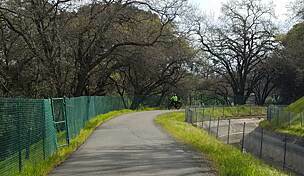 The entrance at the west end of the trail next to I-80 near the southeast corner of Solano Community COllege is chained shut. Beware if you enter on the east end near Chadbourne Rd as you will have to backtrack all the way to Chadbourne.